Promethazine is used as an anti-histamine and neuroleptic drug, meaning it is used to treat allergies and calm the nervous system respectively. In general, the medication is also used to treat nausea, pain, vomiting, reduce nervousness, motion sickness, etc. Promethazine Overdose is the accidental or intentional intake of the drug in dosage higher than prescribed values. Promethazine is used as an anti-histamine and neuroleptic drug, meaning it is used to treat allergies and calm the nervous system respectively. In general, the medication is also used to treat nausea, pain, vomiting, reduce nervousness, motion sickness, etc. What are the Causes of Promethazine Overdose? What are the Signs and Symptoms of Promethazine Overdose? The signs and symptoms of Promethazine Overdose can vary from one individual to another. It may be mild in some and severe in others. Several systems of the body, such as the nervous system, vascular system, urinary system, etc. may be affected. How is First Aid administered for Promethazine Overdose? Who should administer First Aid for Promethazine Overdose? 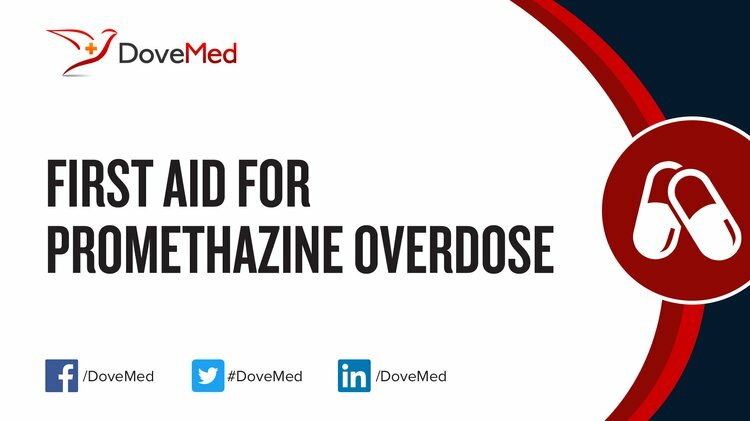 First aid for Promethazine Overdose is administered by healthcare professionals. What is the Prognosis of Promethazine Overdose? How can Promethazine Overdose be Prevented? Church, M. K., Maurer, M., Simons, F. E. R., Bindslev‐Jensen, C., Van Cauwenberge, P., Bousquet, J., ... & Zuberbier, T. (2010). Risk of first‐generation H1‐antihistamines: a GA2LEN position paper. Allergy, 65(4), 459-466. Brown, E. T., Corbett, S. W., & Green, S. M. (2001). Iatrogenic cardiopulmonary arrest during pediatric sedation with meperidine, promethazine, and chlorpromazine. Pediatric emergency care, 17(5), 351-353. Shapiro, B. J., Lynch, K. L., Toochinda, T., Lutnick, A., Cheng, H. Y., & Kral, A. H. (2013). Promethazine misuse among methadone maintenance patients and community-based injection drug users. Journal of addiction medicine, 7(2), 96. Bosse, G. M., Spiller, H. A., & Collins, A. M. (2008). A fatal case of venlafaxine overdose. Journal of Medical Toxicology, 4(1), 18-20. Lynch, K. L., Shapiro, B. J., Coffa, D., Novak, S. P., & Kral, A. H. (2015). Promethazine use among chronic pain patients. Drug and alcohol dependence, 150, 92-97. Juurlink, D. N. (2016). Activated charcoal for acute overdose: a reappraisal. British journal of clinical pharmacology, 81(3), 482-487. Kawasaki, C. I., Nishi, R., Uekihara, S., Hayano, S., Kragh-Hansen, U., & Otagiri, M. (2005). How tightly can a drug be bound to a protein and still be removable by charcoal hemoperfusion in overdose cases?. Clinical Toxicology, 43(2), 95-99. Parker, S. D., Gioannis, A. D., & Page, C. (2013). Chronic promethazine misuse and the possibility of dependence: a brief review of antihistamine abuse and dependence. Journal of Substance Use, 18(3), 238-241. Tanaka, N., Kinoshita, H., Kuse, A., Takatsu, M., Jamal, M., Kumihashi, M., ... & Ameno, K. (2012). Forensic toxicological implications of pleural effusion; an autopsy case of drug overdose. Soudni lekarstvi, 57(3), 48. Bréhin, C., Cessans, C., Monchaud, C., Lavit, M., Majorel, C., & Claudet, I. (2016). A pseudoencephalitis presentation of a pediatric non-intentional intoxication. European Journal of Paediatric Neurology, 20(3), 418-420.